Bloggers in Bangladesh are facing increasingly violent threats for their criticism of religious conservatism. In the past month, two bloggers, Oyasiqur Rahman Babu and Avijit Roy, have been hacked to death in public. Both assassinations were allegedly planned and carried out by religious fundamentalists. This is not the first time the exercise of free speech has led to such brutal violence in Bangladesh. In 2013, in the face of mass protests surrounding war crimes trials, political bloggers received brutal threats from both religious conservative leaders and the national government. 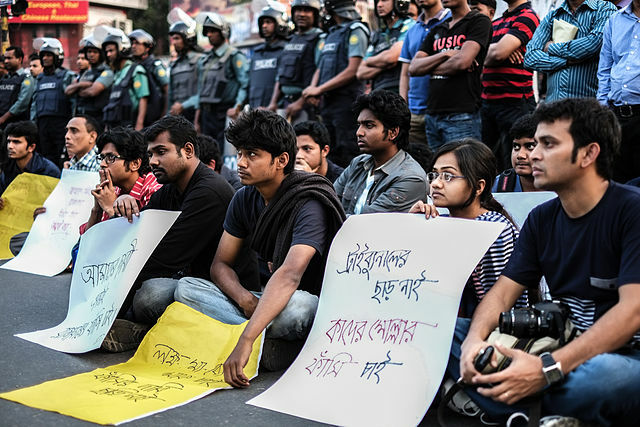 Four bloggers involved with the protest movement were arrested and charged with “insulting Islam,” and another, Ahmed Rajib Haider, was assassinated outside his home in the capital city of Dhaka. At the urgings of conservative Muslim clerics, authorities formed (link in Bangla) a committee to track bloggers and Facebook users who made derogatory remarks about Islam and the Prophet Mohammed. Although there is no sharia or blasphemy law in Bangladesh, the country’s penal code stipulates that any person who has a “deliberate” or “malicious” intention of “hurting religious sentiments” is liable to imprisonment. That section has been used against Internet users on several occasions. Just last spring, two teenagers were attacked by a mob and then arrested by police after they were alleged to have posted “derogatory comments against Islam and Prophet Mohammed” on their Facebook accounts. Rahman, the blogger who was killed just this week, wrote pseudonymously as Washiqur Babu on Facebook and various local blogs, and was known for his critiques of conservative Muslim teachings. Until his death, his legal identity was unknown among most members of the online communities to which he belonged. It is unclear how his attackers uncovered his identity. A Singaporean teenager was arrested for posting a YouTube video disparaging Christians and celebrating the death of Lee Kuan Yew, the country’s founder. In the video, the young man said Lee Kuan Yew “created an environment where his blatant flaws as a leader were hidden because most people were afraid of criticizing him.” He faces charges under Singapore’s religious harmony laws which ban “deliberate intention of wounding the religious or racial feelings,” and could face more than three years in prison. Google AdSense issued a policy violation notice to the anti-interventionist website AntiWar.com after the site posted reproductions of the widely distributed photos of prisoner abuse at the US-run Abu Ghraib prison in Iraq. In an email to the website’s managers, Google explained that it does not allow Google ads to be placed on pages with “violent or disturbing content” and that the site would be suspended from Google’s ad network. AntiWar.com co-founder Eric Garris says the Web page in question did not feature Google ads, but that there were remnants of AdSense code, which may have triggered the notice. A portion of Italy’s anti-terrorism law passed in the wake of Charlie Hebdo was struck down after Prime Minister Matteo Renzi requested the removal of a provision would have allowed law enforcement to “intercept the flow of communications relating to information or computer systems” through remote access technologies such as trojan horse and keylogger malware. Egyptian President Abdel Fattah el-Sisi called the Internet a “new terrorist danger” in a speech before the Arab Summit in Sharm El-Sheikh. In the speech, he warned that terrorist groups “misuse the Internet and information networks” to incite terrorism, panic, and extremist thought, and called for a set of principles for the safe use of information technology. The UK Court of Appeal ruled that the “Safari Users Against Google’s Secret Tracking” group indeed has the right to sue Google for bypassing the privacy settings on Apple’s Safari browser in order to install cookies that would allow the company to display personally tailored ads. This may lead to a spike in class-action lawsuits against US companies offering services in the UK. Maybe the UN can help? The United Nations will soon appoint a Special Rapporteur on the right to privacy under the Human Rights Council. The Special Rapporteur will be responsible for covering privacy issues including, police search and seizure, state restrictions on personal relationships and intrusions on privacy by businesses. Ellery Roberts Biddle, Mohamed ElGohary, Lisa Ferguson, Weiping Li, Hae-in Lim, Bojan Perkov and Sarah Myers West contributed to this report. NO the U.N. cannot and should not help. The U.N., and all its sister organizations including the IMF, WTO and the World Bank, is a fiasco of injustice parading under the pretense of humanity, headed and directed by some of the mightiest corporate criminals. It will not improve matters.